Everyone wish to have a clean house but who loves to do the cleaning? No one can dare but cannot ignore either. Which part of your home do you find annoying to clean? It is the bathroom we know and the struggle is real! Especially when you are too busy with your inside and outside world. One cannot ignore that the bathroom is one of the busiest places in our home and it gets dirty rapidly as well. Hence, it requires extra care. We understand it is a bit challenging for full-time working people. But still, if you make some cleaning checklist, then your job will be easier. 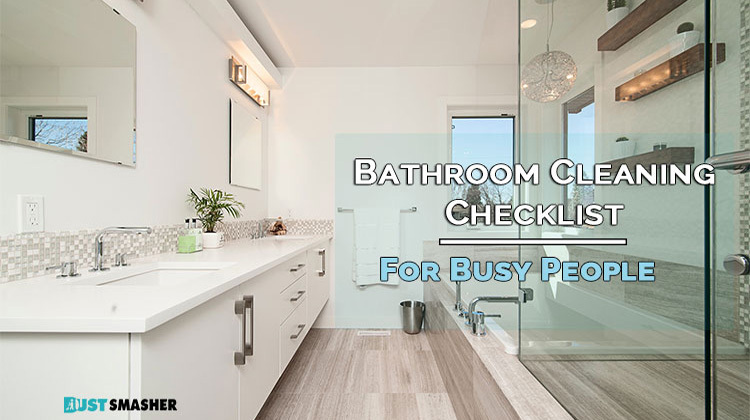 Don’t worry, here we come up with a complete bathroom cleaning checklist for busy people. A little bit of extra alertness will make your work much more manageable. You can either do cleaning some cleaning daily, thrice or twice a week, or else once a week. Let’s get started. The very first things you frequently need to check is the bathroom cleaning supplies. Check the followings and purchase them when they are finished. Make sure that you have all these cleaning supplies on your home. So, it’s time to consider a few cleaning checklists. The shower area where most of the water stays such a high chance for debris build up. Make sure to wipe the excess water in the wall daily. You can use vinegar to clean the shower head once in a week. Also, clean the shower base using floor cleaner and wipe the excess water. The toilet is the place that welcomes germs. Since you stay busy so make sure to choose a particular day for cleaning the toilet. Moreover, you can use the toilet more carefully to avoid frequent cleaning. We prefer to use shortcuts like using toilet bowl cleaner. We suggest the same tactics for floor cleaning as well. To inhibit debris build-up, make sure to wipe the floor with the mop. In case, it becomes too dirty then select a specific day for cleaning. You can use a floor mat to avoid daily cleaning. Use a shower caddy to organize your necessary equipment for the shower. Like, shampoo, conditioner, soap, and many more. Also, keep your towels in place every time you enter. The bathroom counter can become messy if you don’t maintain properly. Organize the toothbrush holder accurately with toothpaste and toothbrushes. Also, place other items in groups to get easy access to things. Make sure to wipe the counter frequently to avoid mildew buildup. The sink is the place where toothpaste residues build up after daily brushing. Use a sponge or washcloth or wipe daily to avoid a harder-to-clean mess after a while. Or else, fill the sink with warm to remove daily residues. Keep an eye on supplies cabinet. Throw away the bottle that is finished or expired and purchase a new one as soon as possible. Also, wipe the cabinet to avoid dirt build-up. The above to-do list can become easier if you follow some clever tips. Since you are one among those smart working people so do it wisely! Store supplies and basic kits in easy-to-access location to avoid untidiness. Clean the shower glass door, mirror and other using any powerful spray to keep it clean longer. Or else, use a microfiber cloth for a quick wipe. While cleaning, let the cleaning products soak the surface in while you complete another part. Change the floor mat, wastebasket, and rugs frequently. Clean a little instead of doing all together at the weekend. Get rid of that stuff that you don’t need for cleaning anymore and buy exclusive stuff. Enlist your family member in cleaning task and divide the task according to their ease. However we stay busy in our modern life, bathroom cleaning is an annoying task for all of us. It becomes too difficult to arrange some time to spend hours in bathroom cleaning. Still, doing this regularly and taking the help of family member makes the job stress-free. We hope our article on bathroom cleaning checklist for busy people was helpful. If you find it useful then, our effort will be successful. We do believe; everyone deserves a clean bathroom.